Making paint does generate some extra work, but it gives you a certain purity to work with. Factory paints look more 'perfect' than home-made paints, but sometimes that's exactly what you don't want. Making paint gives you a feeling of edibility, of natural materials, of authenticity. 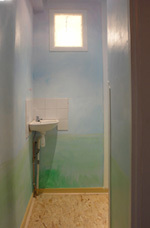 It also helps you to feel your way into your materials, and to help you understanding the material process of painting. And last but not least: you have control over the degree of toxicity you're working with. You can make your own non-toxic paint. For egg-tempera and caseine, you need pigments that are ground in water. 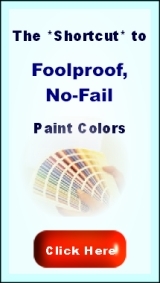 Some pigments are toxic, click here for info on non-toxic pigments. If you have dry pigments, grind them in water with a glass muller on a plate of marble (or glass). Wear a dust-mask while you stir water into the pigments. Even when the pigments are non-toxic, it's not good to get them into your lungs. You should get a paste as thick as toothpaste - if you dab it with a palette knife, sharp tips should be standing up. Egg tempera is made of eggyolk, and pigment-paste (pigments in water). You only use the inside fluid of the eggyolk. Roll the eggyolk over from one hand to the other, wiping the free hand dry on a cloth. If it's dry, hold the yolk, pinch it, let the content flow in a glass and try to hold on to the skin of the yolk. After that, dilute the yellow stuff you have with half an eggshell of water. This mixture goes 1 on 1 with the pigment paste. It's a very thin, fluid paint - which is good because it prevents too thick paint layers. Use the paint before the egg starts to rot (you can imagine the smell). And, a real pity: it's no use freezing little cubicles of egg or caseine for making paint later. It ruines their inner structure. Egg-tempera can be made with a painting medium (oil and varnish) as well. Here you'll find an oil painting guide, which contains lots of recipes for making egg-tempera paint, and also egg-caseine tempera, acrylic-caseine and oil paint. In these recipe sheets you'll find how to make egg tempera paint, along with a few other recipes for canvas primers and underpainting - both the modern and the traditional way. There's a product list as well. The products were selected to be least expensive, while delivering quality. Like in the supermarket: it's not about shiny packages, but about knowing what ingredients are worth, no matter if it's cheap or expensive. If you want to read more, check out my e-book (76 pages) on oil painting materials. The recipe sheets are a free download, when you subscribe to this website. Both caseine paint and egg-tempera paint dry very quickly. But, after these two minutes they're still soft (like cheese). They need a few days to harden out. Be careful not to touch the walls for a few days. In time, the egg-tempera is very durable. Slowly, it gets harder and harder, and in 30 years it turns to stone. Caseine paint hardens out a bit faster, but also needs care in the beginning. If you put egg-tempera on canvas, you can varnish the underpainting with dammar varnish after a day's drying, to make it more solid. In case you want to do some brushing and rubbing, while you paint it with oils. Caseine is a very strong glue, it's only good for the underlayers. It's good to either thin the binder with water, or to do with 1 volume of caseine paste to 3 volumes of pigment paste. Caseine paste can be bought ready made in the online art store (brand: Shiva). Caseine paint on the wall is best applied in thin washes, caseine is one of the strongest glues, it can be worked very thinly diluted. Egg-tempera paint is best applied in more or less hiding coats. 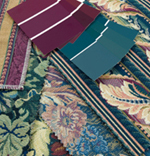 Click here for interior painting tips on the effects of underlying paint colors. Egg tempera and caseine paint look very matte and natural, and they give beautiful velvety colors. They have an utter natural appearance, which is also great for getting an antique or historic feeling. When you want to do a big wall of tempera paint, use whole eggs for making paint, and beat them. 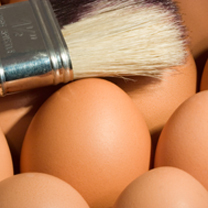 For every egg, you add half an eggshell of pigment paste. Egg-tempera should be used right away after making it. You can keep it fresh for a day in the fridge. Caseine paint is also known as 'milk paint': one of the oldest and most durable paints used in America. It's non-toxic and suitable for wood (kids' furniture and toys!). 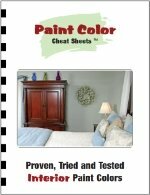 Click here to find a website where you can order this paint. It comes in powder that you have to add water to (and then the paint has to be used within a day or so). It's like an instant-mix for making paint. A layer of oil paint dries very slowly, and a tempera underpainting can be worked on repeatedly in one day. It gives you a quick start. Egg-yolk is an emulsion (fat and water mixed). If you combine it with oil painting medium, you can use it in wet layers of oil paint and speed upt the drying process, without jeopardizing the durability of your work. This is the way the old Dutch masters worked, in the gilden age. It was their way to gain some material subsance and working speed. For underpainting, use a watery egg tempera (just egg and water), and for working into oils, mix the eggyolk with painting medium. In this oil painting book, you'll find recipes for both kinds of tempera (along with info on how to use it). Shellac paint was used for colored wood polishing ('french polishing'). Shellac only dissolves in alcohol, and then you add dry pigments. At Paint mill De Kat, they have a recipe (look for 'french polish'). 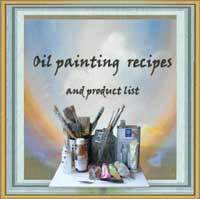 I've put together an oil painting book, in which you'll find over ten recipes for paint making: from acrylic gesso primers, to making lean and fat egg tempera, to egg-caseine tempera and shellac, to making oil paint. Check it out here.